After you are happy with the drawing you will do your first wash which is the watercolor underpainting. I make very pale, separate mixes of Cobalt Blue and then another of Cad Orange.These will go into the sky as in the image of the finished underpainting below. I also use a mix of French Ultramarine, Alizarin Crimson and a touch of Burnt Sienna for the road surface. I start by laying down the wash of Cad Orange (remember this must be very pale or it will lose its transparency) and Cobalt Blue in the sky. These washes go over the building areas as in the image. 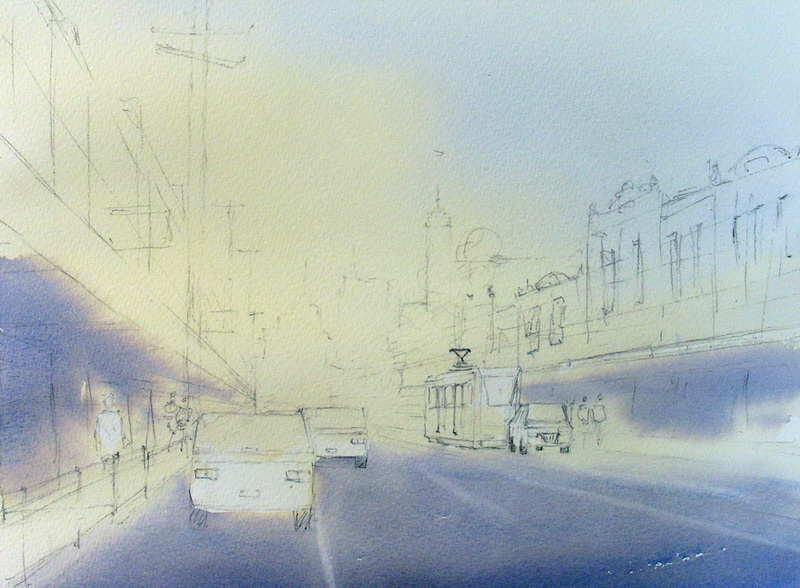 This under wash over the buildings will act as the cool and warm highlights later in the painting. Make sure the sky washes have lots of water in them and let the Cad Orange mix bead at the top of the distant road surface. Then put in the road wash. In this case you want to create a graded wash from light in the distance to strong tones in the foreground. Furthermore the Cad Orange bead should flow into the road and create a lighter section which will enhance the distance effect. Drop some of the road mixture under the awnings to act as an under wash for the shadows there. Leave this watercolor underpainting stage to dry thoroughly.